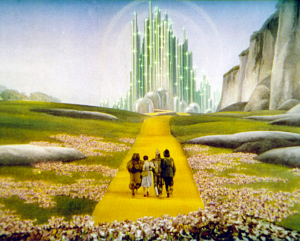 WNO celebrates the magical movie The Wizard of Oz with a stunning live accompaniment at St David’s Hall on Sunday 10 September. Forget scratchy soundtracks – this is the chance to hear Over the Rainbow, Follow the Yellow Brick Road and all your favourites in vivid orchestral technicolour complete with original vocals. Released in 1939 by MGM as an enchanting adaptation of L. Frank Baum’s novel, The Wizard of Oz has become an icon of American popular culture. The film – starring the legendary Judy Garland as Dorothy – went on to two Academy Awards for Best Original Song (Over the Rainbow) and Best Original Score by Herbert Stothart. Nearly 80 years later, it is still widely regarded as one of the greatest movies ever made. In partnership with the National Concert Hall of Wales and Chapter, Welsh conductor Grant Llewellyn leads a 65-strong orchestra, who will play alongside an entire screening of the family favourite that is ideal for all ages. Before the concert at 3pm, there are a host of free family-friendly activities throughout the foyers of our very own Emerald City from 1pm. Why not try out an instrument with members of the WNO Orchestra, or help find the Tin Man’s heart in the treasure hunt? Plus, you can unleash your inner Dorothy in a Wizard of Oz themed sing-along on Level 3 led by WNO’s own, Angharad Morgan in her sparkly red shoes. Join us on a journey along the Yellow Brick Road with the WNO Orchestra – the perfect treat for munchkins of all ages! Tickets are £21.50, and £11.50 for under 16s. A Family Ticket for 4 is available for only £40 (must include a minimum of one adult). All prices are subject to an optional extra £1 postage fee.